According to the Associated Press, the process to remove 2,300 tonnes of fuel from the Costa Concordia is finally underway. The pumping began on Sunday afternoon, with the work being done by Dutch Salvage company Smit. The initial plans are to concentrate on the first of fifteen tanks that are believed to hold 84% of the ship's fuel. The process involves attaching two valves to each fuel tank, one at the bottom and one at the top and slowly pumping the fuel out. The engineers will also need to carefully warm the fuel to reduce viscosity in order to make the process more efficient. The fuel is then being pumped to crane barge alongside the ship, before being transferred to a waiting oil tanker. The process is expected to take four weeks to complete. Costa have been waiting two weeks for the process to begin due to various weather conditions making it too unsafe to begin, as there were fears the ship could move from its resting place. There is now a matter of urgency to prevent any fuel leaking onto Giglio's pristine coastline, though no major leaks have been reported as yet. 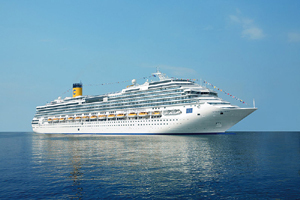 Costa have yet to announce whether the ship will be salvaged or taken apart for removal, though the entire process is expected to take seven to ten months, regardless of how the Costa Concordia is moved. On Sunday Italian President Giorgio Napolitano and other senior officials attended a memorial mass in Rome for the victims of the tragedy. Napolitano said: "[he was sorry that what transpired] was the responsibility of Italy and Italians... We must continue to investigate. Prosecutors deserve respect for the job they're doing."